Sometimes, the solution to a problem is staring you right in the face, but you refuse to see it because you are blinded by your perceptions, your beliefs, or the distortions others have placed in your mind by lies and falsehoods spread about the real benefits of the solution, or the downsides. Case in point, the question of single-payer health care in the US. The health insurance industry and their lobbyists and defenders in Congress have done a great job poisoning the minds of many Americans against the idea of single-payer, whether on ideological or economic grounds. What they did not know or realize, was that it wasn’t THEIR Medicare, but the government’s Medicare. They were ones receiving the benefits. So, it struck me this morning when I read an article by Tom Lynch of the Lynch Ryan blog, Workers’ Comp Insider.com. The article, The American Health Care Paradox: A Lot Of Money For Poor Results, compares the US health care system with the health care systems of the OECD nations (Organization for Economic Cooperation and Development). The OECD has 35 members, of which the US is one, and was formed in Paris in 1961. They promote policies that will improve the economic and social well-being of people around the world. It also performs annual comparative analyses of issues affecting its members. Health care is one such issue, as is life expectancy, infant mortality, obesity, and death rates from cancer, among other health care-related topics. But regarding health care, as Tom reports, on a per capita basis, we spend 41% more on health care than our wealthy nation peers in the OECD, and 81% more than the entire OECD average. 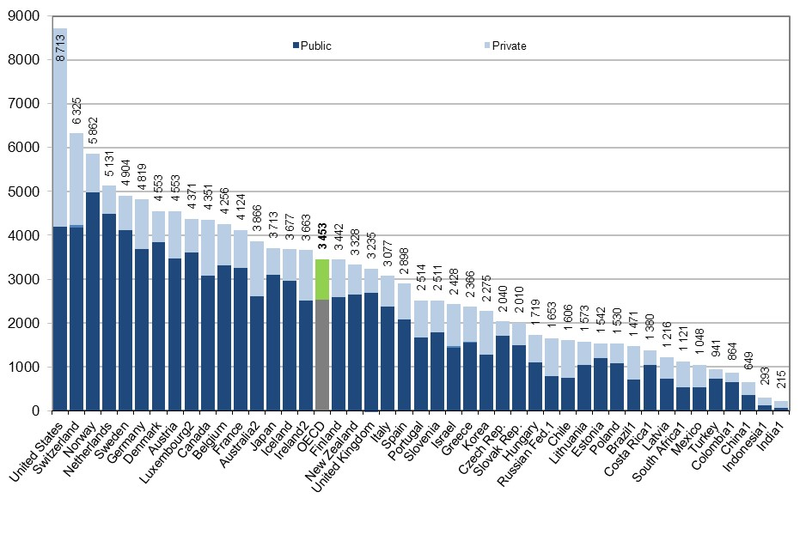 The following graph indicates amount of public versus private funding of health care among the OECD nations, as well as the OECD average. The light blue bars indicate private funding; the dark blue bars indicate public funding. According to Tom, while our public funding (Medicare, Medicaid, etc.) is comparable to many of the other countries in the OECD, private funding in the US is more than 100% greater tham Switzerland, and 300% greater than the OECD average. Infant mortality: US: 6.1% (per 1000 live births) 45% higher than UK at 4.2%, and 265% higher than Japan’s at 2.3%. Obesity and overweight rate is exceeded only by New Zealand. Finally, the rate of death from cancer per 100,000 people is 188, Mexico’s is 115, Japan’s is 177. But we lead the world in smoking cessation (whoopee!). So, I guess we can all breathe easier now than the rest of the world, especially the third world where so many start smoking at a very young age. Into this discussion, Tom throws the current Republican tax plan, which he rightly says will throw 13 million people off of health care, and see $25 billion cut from Medicare. Tom says that fixing health care will take time and a lot more money, and he is skeptical that the GOP tax scam will do that. Duh! Of course it won’t. That’s the whole point of the tax scam and the umpteenth attempts to scuttle the ACA. They don’t believe in health care as a right for all Americans. It is in their DNA as Libertarian Conservatives. They are not Republicans, at least not like the two Republican presidents who tried to get health care passed, Theodore Roosevelt and Richard Nixon. No, they want the money for their fat cat donors. They even said so publicly and bragged about it. And if all those votes to repeal and replace ACA didn’t convince you that they are fundamentally opposed to any government-sponsored health care, except their own, then you are blind. The solution is staring you in the face on the above chart, Every other OECD member nation spends more publicly for health care than we do privately, and we are getting bad outcomes. Why is that? It is because health care is not like other consumer goods, and therefore should not be funded or marketed by private companies. It is long past the time we should follow suit and do what every other OECD country has done, create a single-payer, improved Medicare for All system and stop fooling ourselves that the private market works. It does not, and the proof is in the metrics on cost, life expectancy, infant mortality, obesity and cancer deaths, etc. This entry was posted in ACA, Affordable Care Act, Analytics, Congress, Health Care, Health Care Costs, Health Care Reform, libertarianism, Medicaid, MEDICAL COSTS, Medicare, Medicare for All, OECD, Outcomes, private funding, Republicans, Single Payer and tagged ACA, Affordable Care Act, Congress, Costs, Health Care, Health Care Costs, infant mortality, Life Expectancy, Medical Costs, Medicare, Obesity, OECD, private funding, public funding, rate of cancer deaths on November 29, 2017 by Transforming Workers' Comp. 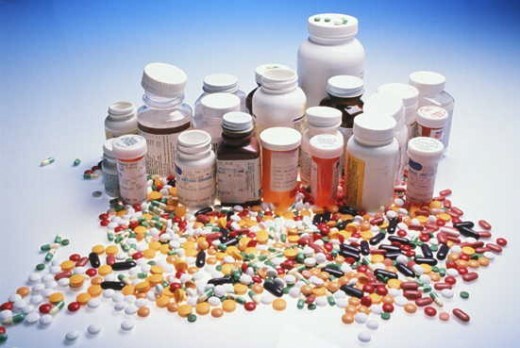 As previously discussed on this blog, prescription pain medication abuse is a big problem in workers’ compensation, (see Opioid Abuse in Workers’ Compensation: What the Medical Tourism Industry Needs to Know). There has been a lot of writing on the subject, and a great deal of meetings, webinars, and conferences, with very little solutions being offered, or action taken besides passage of legislation and the creation of state-run databases, as in Kansas and California. But recently, as reported last week in the Wall Street Journal article, “When Your M.D. Is An Algorithm” by Timothy W. Martin (April 11,2013), a summit was held in Orlando, Florida that brought together patient advocates, policy makers, and law-enforcement officers, as well as representatives of a new cottage industry: companies that are taking a data-driven approach to deal with the drug-abuse problem. The National Rx Dug Abuse Summit showcased companies that are combining medical research and guidelines with computer analysis to guide doctors about what drugs should be administered, in what doses, or if at all. These companies, mainly insurers and medical-bill review consultants for companies paying workers’ compensation claims said they are filling an unmet need: that of providing research-driven clinical advice and guidelines to doctors who have not been thoroughly trained on how to treat pain. There are some doctors, who are skeptical of these programs that have names such as “Opioid Defense Manager” and “VantageComp”. They do not believe that these programs play any role in medical treatment, especially when they are used by companies looking to lower drug costs and medical spending. One of the 40 analytic companies that attended the conference was Rising Medical Solutions, Inc. Their in-house algorithms, assesses whether an individual is a low, medium or high risk. This is based on a 30-question survey that asks about an injured worker’s optimism about their recovery, their previous injury history and whether they smoke, along with other signs that measure their vulnerability to painkiller addiction. PMSI’s proprietary Risk Intelligence System, has 18 criteria it says could signal fraud or abuse. According to Ishita Sengupta, director of workers’ compensation at the National Academy of Social Insurance, a nonprofit research group that tracks workers’ compensation benefits and costs, the analytics-driven industry has grown to more than three dozen companies from just a handful a decade ago. Insurance companies such as AIG, Liberty Mutual and Travelers have added analytical or predictive modeling abilities to their workers’ compensation divisions. All this growth in a nascent industry such as analytics comes about because workers’ compensation spending is soaring. As Martin points out in his article, and as I have pointed out in my white paper, Legal Barriers to Implementing International Medical Providers into Medical Provider Networks for Workers’ Compensation, the average medical cost for lost time claims was $28,000 in 2011, which was nearly double the cost in 2001, when the cost was $15,900. Both Martin’s article and my white paper cite data from the National Council on Compensation Insurance (NCCI), an industry-created company that tracks workers’ comp spending and the overall health of the industry. So as the medical tourism grows, and the idea to implement medical tourism into workers’ compensation becomes a reality, medical tourism facilitators and medical tourism providers will be able to know beforehand if a surgical patient who was injured on the job and receiving medical treatment abroad, is already a painkiller abuser or could become one. The provider will have the benefit of the knowledge provided by analytics to determine risk of addiction so that patient addiction can be halted or avoided altogether. This in turn, will also help the wider medical tourism industry because the very analytics used to determine risk of addiction for injured workers can be used for non-occupational injury patients receiving the same surgery. And that will give the medical tourism industry more credence with the healthcare community at large. This entry was posted in Analytics, Drugs, Medical Tourism, Pain Medication, Prescription Drugs, Technology, Workers' Compensation and tagged abuse, addiction, analytics, Drugs, Medical Tourism, Pain Medications, painkillers, predictive modeling, Prescription drugs, Workers' Compensation on April 14, 2013 by Transforming Workers' Comp.